Hello! Good evening! Hope your day was TERRIFIC! I have been SOOOOO BUSY getting ready for my 14 Day's of Love class this Saturday! It's gonna be FUN! Even though it's late in the evening, I want to share another project we will be making in my classes this month! This card is created with the Heartfelt Blooms Sale-Bration stamp set. You can choose this stamp set free with any $50 purchase (before tax and shipping). It is stamped in Fresh Fig ink and layered onto a piece of Fresh Fig cardstock. The card base is Whisper White with a layer of Fresh Florals designer paper, also in Fresh Fig. 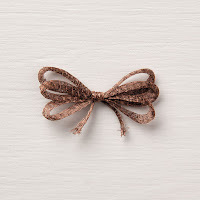 I also tied a bow using 1/8" Sheer Fresh Fig Ribbon to finish it off! I think its lovely! Well...that's today's creation! I hope you are inspired to CREATE! Thank you so much for stopping by! Stunning! I love the fresh fig! Nice work as always Darla! Thank you Kim! I too, LOVE the IN-COLOR Fresh Fig! Thanks for always encouraging me! I LOVE that you follow my blog!!! ENJOY your day!